Duct & Vent Cleaning of America, Inc. is on the job at The St. Regis Hotel in New York City. The St. Regis Hotel, a world renowned five star rated hotel and legendary landmark in the heart of Manhattan, has more than 160 guest rooms and 65 suites. The St. Regis Hotel recently approved Duct & Vent Cleaning of America, Inc. as a subcontractor to assist with an extensive renovation project. The mechanical contractor who brought Duct & Vent Cleaning of America, Inc. in to perform the work has high expectations and is confident Duct & Vent Cleaning of America, Inc. is the right company to perform this delicate project. Using portable HEPA equipment, the Duct & Vent Cleaning of America, Inc. team is working under tight deadlines to properly HEPA vacuum and seal all of the air registers on multiple floors throughout the building. Three crews per day work in extremely tight quarters under tight time constraints. Crew members have overcome the difficulty of staging manpower in between other renovation projects, such as demolition and painting. 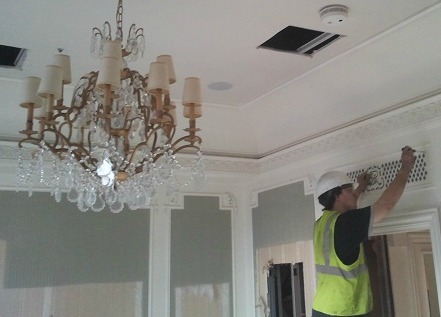 "Each room has a lot of decorative material," said Duct & Vent Cleaning of America, Inc. Territory Account Manager, Scott Solomon. This includes custom-made furnishings, including silk wall coverings. Because of Duct & Vent Cleaning of America, Inc.'s proper planning and careful diligence, they are able to ensure nothing is damaged. Additionally, after each air vent is thoroughly cleaned, the Duct & Vent Cleaning of America, Inc. team is covering the duct work with duct mask, to ensure no cross contamination happens. "This requires precision cutting exactly to size," said Solomon. Duct & Vent Cleaning of America, Inc. expects to be on site for approximately two months. Due to their careful and thorough work, patrons at The St. Regis Hotel can be assured they will enjoy dust, debris and fungus free air while they're visiting the hotel. Duct & Vent Cleaning of America, Inc. provides commercial air duct cleaning and residential air duct cleaning services to MA, CT, RI, NY, NH, and MD. We proudly serve all cities and towns throughout the Northeast including: Boston, Baltimore, New York, Providence, Hartford, New Haven, Worcester, Springfield, Nashua and more!